Millennials are catching a lot of heat these days. The stereotype, in the grand tradition of old people rolling their eyes at young people (and barely worth repeating), is that they’re whiny, entitled, coddled, and distracted. Except that they’re not. These 30, at least – and many others we know – are clear-minded, self-directed, nobly intentioned, action-oriented, extraordinarily motivated – and crazy bright. These 30, in fact, stand as symbols of hope for the future. 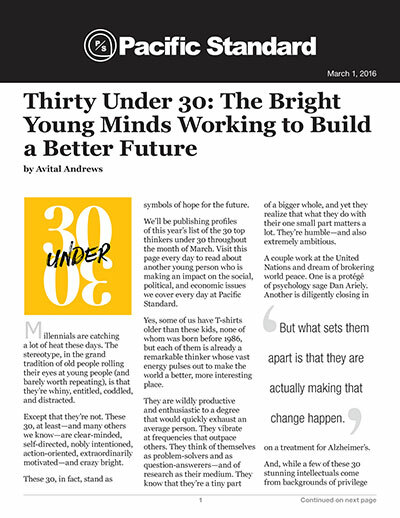 We’ll be publishing profiles of this year’s list of the 30 top thinkers under 30 throughout the month of March. Visit this page every day to read about another young person who is making an impact on the social, political, and economic issues we cover every day at Pacific Standard. Yes, some of us have T-shirts older than these kids, none of whom was born before 1986, but each of them is already a remarkable thinker whose vast energy pulses out to make the world a better, more interesting place. They are wildly productive and enthusiastic to a degree that would quickly exhaust an average person. They vibrate at frequencies that outpace others. They think of themselves as problem-solvers and as question-answerers – and of research as their medium. They know that they’re a tiny part of a bigger whole, and yet they realize that what they do with their one small part matters a lot. They’re humble – and also extremely ambitious. A couple work at the United Nations and dream of brokering world peace. One is a protégé of psychology sage Dan Ariely. Another is diligently closing in on a treatment for Alzheimer’s. And, while a few of these 30 stunning intellectuals come from backgrounds of privilege and ease, most do not. They are children of refugees, immigrants, first-generation Americans, gays, single mothers, kids who grew up in relative poverty, terminally ill, and deaf-blind. In some cases, their hardship was and remains their guiding light. Over the process of interviewing a batch of astonishing minds like this, themes emerge. Imagination is first among them. It’s a word we heard over and over – for these folks, devotion to it is close to religion. There’s also a deep awareness of alternate lives they could have lived, for better and for worse. And then there’s the word “interdisciplinary.” Smart young people are bucking the notion that they need to specialize in just one thing. They recognize that dipping into other fields gives them their best shot at making history. This list is full of polymaths, including an astrophysicist who is also a children’s book author and a food entrepreneur and a policy scholar. Whatever they majored in during college – if, in fact, they even went to college – these powerful thinkers are all focused on some aspect of social justice and activism. Like many, they’re eager to see real change. But what sets them apart is that they are actually making that change happen. Their research moves society forward. They are poised to alter the dialogue. Another common thread that unites these 30 original minds: They all love their job with unbridled passion. While many of us in our forties and fifties compulsively check our 401(k)s, these young people scoff at the idea of ever quitting work. So, Millennials: The next time someone throws you a generation-bashing slur, go ahead and refer that person to this list.